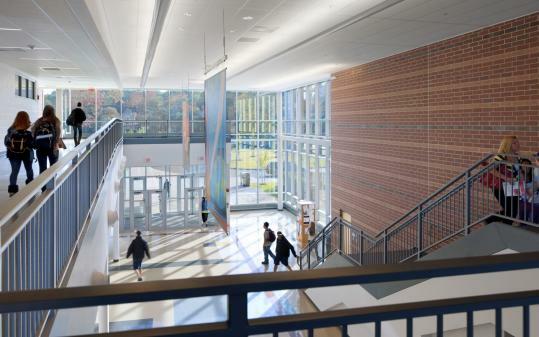 NEWTON — The new Newton North High School was already famous before it opened last month. For years, it had been pilloried as the Taj Mahal of schools, with a cost said to be just under $200 million. More about that cost figure later. Let’s talk first about architecture. Now that the school has been in operation for a couple of months — now that it’s had its shakedown cruise, so to speak — it’s clear the taxpayers of Newton are getting what they paid for. Newton North is one of the most impressive schools I’ve ever visited. You can’t be sure of that until you go inside. From the street, Newton North doesn’t sell itself very well. It’s not, to say the least, a memorable or lovable addition to the city. It looks too much like a string of boxy four-story brick warehouses adrift in a sea of parking lots and athletic fields. That’s too bad. But what a school looks like from the street isn’t what matters most about it. The city can always plant trees. Newton North’s architect, Graham Gund of Cambridge, has solved so many other problems with so much vigor and intelligence that you soon forget the bland outdoor aesthetics. ■ Newton North occupies the same piece of land as its predecessor, the old Newton North, which still stands, empty and abandoned, at the back of the site. It was surrounded by athletic fields. Most of those fields were aligned east-west, guaranteeing that the athletes would experience the torture of staring blindly into a low western sun in spring and fall. Gund rotates them all 90 degrees. It’s the kind of simple, logical move you don’t notice at first. But solving problems like that is a big part of architecture. ■ In the old school, half the classrooms (hard to believe) were windowless. In the new one, all 76 classrooms and student labs are flooded with light, usually from wide, generous windows that frame views of the outdoors. ■ Even the stairs and corridors offer natural light and views. The second-floor library is a particularly marvelous space, a bit reminiscent, with its generous light and natural wood, of libraries by the great Finnish modernist Alvar Aalto. There’s a sense of transparency everywhere you look, the opposite of any feeling a kid might have of being in a Dickensian prison. And huge as Newton North is, you can’t really get lost. Everything is strung along a single main corridor, which is so long — more than 1,000 feet — that it reminds you of MIT’s famous “Infinite Corridor.’’ But Newton’s, unlike MIT’s, exuberantly bends and twists, narrows and widens, and offers an occasional look at the outdoors. There are sudden views of small courtyards, or of the sunken football field. Simply walking around the school is a sensual pleasure. I wish I could say I admired the exterior as much. But the same energy isn’t there. In order to provide windows for all those interior spaces, Gund needed to create a lot of exterior wall. So he stretched the building out in a long, thin shape. But it was hard to fit such a long building onto the site, among the crowd of parking lots and playing fields. To make it fit, Gund bent pieces of it this way and that. The result is a Newton North that looks as if it’s being pushed around. A kinder way of saying that is that the building’s exterior, like the interior, responds to every problem with a solution. But in being so responsive, it fails to assert an identity. Maybe Newton North needs a metaphor. In traditional architecture it might have been conceived as a palace (cue the pediment with columns and cupola), but that feels wrong for today’s diverse democracy. Perhaps a village? In any case, there’s the lack of an imageable, memorable idea. As for the Taj Mahal complaint, that’s misguided. None of the finishes, indoors or out, go much beyond the basic. Indoor walls are concrete block painted white. (The only repeated complaint I heard from students was that the white “makes it look like a hospital,’’ but the walls can be thought of as blank canvases to be enriched over time). The exterior is mostly plain brick in a couple of colors. Some things cost money. Newton North is a school of the media age. There’s a TV production studio, an electronic music lab, a black box theater. All that costs, of course, but surely it adds value. How can a school get kids interested in education if it shows no interest in the media world they live in? Anyway, the cost has little to do with architecture. It’s the client, of course, not the architect, who asks for expensive add-ons, things like the theater with fly loft and orchestra pit, or the championship swimming pool (the pool, incidentally, is to be shared with the city’s other high school, Newton South). Newton North is what’s called a comprehensive school. Unlike most academic high schools, it offers programs in vocational technical training: construction, automotive, culinary, several others. Of course these, too, add cost. And the $197 million total price, which was widely published, includes the cost of removing the old Newton North and millions for asbestos disposal. Finally, the construction job was bid in early 2007, an era of high prices just before the economic collapse. Doubtless in another era, Newton’s school planners, for better or worse, would have been less ambitious. Gund’s office, as design architects, worked with the firm of Dore & Whittier Architects. Both should be pleased with this thoughtful building.